We are too hard on ourselves. Women in general are too critical of our flaws, weaknesses, failures and shortcomings. What is most important to remember is you’re never going to be who you most desire to be. That may seem like I’m deflating your hopes and dreams but I hope you know that is not my intention in the least. 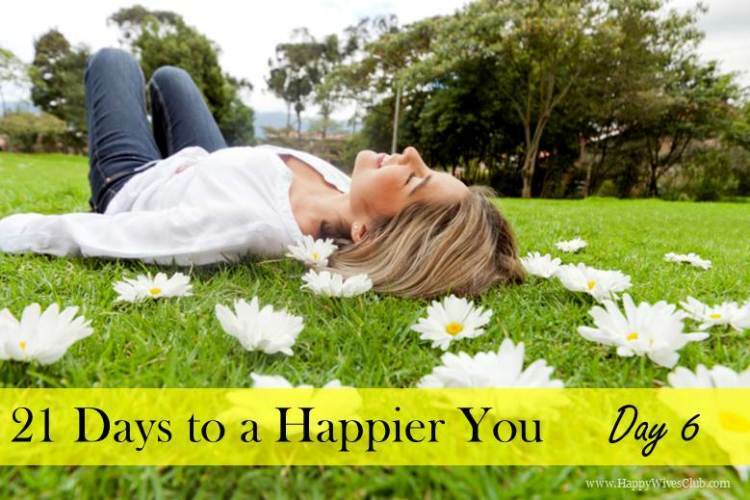 My greatest desire during this 21 Days to a Happier You series is to help you take your happiness up at least a few notches. Sometimes that requires a bit of a reality check. Perfection is not something to be pursued. It is a fleeting notion always accompanied by disappointment. We as human beings were never meant to be perfect. But we were, however, made to love, to be loved, to enjoy this life and create happiness within our lives and those around us. If you accept perfection is not possible, it becomes a bit easier to give yourself a break for every mistake you make. It becomes more acceptable to give yourself a pat on the back for everything you do right and to celebrate little victories every day. Be proud of the person you are today, at this very minute, in this brief moment in time. If you are like me, you are not yet who you most desire to be, and there is much work that remains to be done. But you are so much better than you once were and over time you will continue to grow and be molded into the person you were created to be. It is an ever-evolving proposition that will continue throughout your lifetime. But right now, this very second, you are who you are and that is a beautiful person. Appreciate that. Be comfortable with who you are and confident in where you are going. Removing perfection, or the pursuit there of, from the equation of your life frees you up to pursue what is truly important. What is of the most significance in your life, your husband’s, your family, friends and those around you, can only be attained once you give up the need to be perfect. Accepting that everyone around you is just as flawed as you are -maybe even more- should put a smile on your face and allow a softness in your heart. On the flip side of this, accepting other’s differences and shortcomings, and not being critical or judgmental of them, will naturally allow you to experience more grace in your own life. It is a reciprocal blessing received the moment you begin to accept people just as they are, flaws and all. Before I close our this blog post for today, I’d like to invite you to take a brief moment to give a gift to yourself. Simply pause and inhale deeply. Take a deep inhale and hold it for a few seconds before letting our an equally relaxing exhale. Repeat this as many times as you need until you can let go of everything around you causing any form of stress and simply whisper to yourself, “I am exactly who I am meant to be at this very moment and minute by minute, I will only get better.” Now, spend the remainder of this day bringing that quote to life. I totally agree with you. There is so many things to do before we will be perfect for ourselves, but if we will look back, we’ll see how different, better we are already; how many things has changed over time and how differently we are looking at.. everything.